Storage wars erupt when Brandy Borne and her suspiciously well-informed mother, Vivian, win an abandoned storage unit's "mystery" contents. The good news is a rare vintage cornet. The bad news is the recently stowed body of Big Jim Bob, Vivian's former tipster. Even worse, an intruder steals into the Borne home to mete out some ruff justice to Brandy's ferociously fluffy shih tzu, Sushi, while making off with the heirloom horn. When the sleuthing duo finds another stashed victim, the hunt is on for a corpse-hoarding killer who's trying to blow "Taps" for all concerned. . . 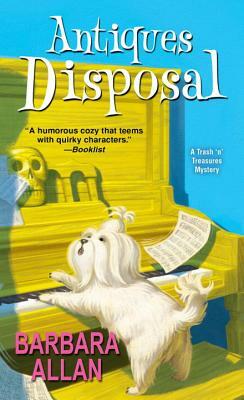 Praise for Barbara Allan and the Trash ‘n' Treasures Mystery Series. . .